File this under: News you won’t likely read in the mainstream media. Local Muslims helped a young Iraqi Christian escaped from his kidnappers this week. Namir Nadhim Gourguis was rescued by Iraqi forces and Awakening Council members from his kidnappers near Kirkuk. Namir Nadhim Gourguis, a 32 year-old Christian teacher, has been freed. A joint operation yesterday between the army and Arab forces of the reawakening in Kirkuk, led to the release of the young man who was kidnapped on May 14th by an armed group. AsiaNews sources in Iraq explain that “mediation with tribal chiefs” and “collaboration provided by the local Imams” proved to be decisive in securing his freedom. The kidnappers “did not receive any ransom”. The kidnapping took place the morning of May 14th: an armed group of four men broke into the primary school in Ruwaidha village – in the sub district of Al Rashad, circa 30 from Kirkuk – abducting the young man. Local sourced explain that he “is from a simple and poor family background”, that the ransom demanded by the kidnappers was “very high” and the family “was unable to pay it”. 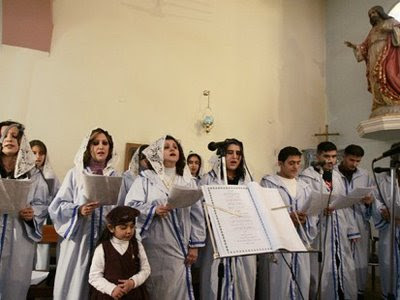 Collaboration between the Christian community, the Arab world and local tribal chiefs was detrimental (sic) in securing the Namir release for which the Archbishop of Kirkuk, Msgr. Louis Sako had also immediately intervened. “Today is a day of great celebration for the Christian community. Don’t expect the media to report on this anytime soon.